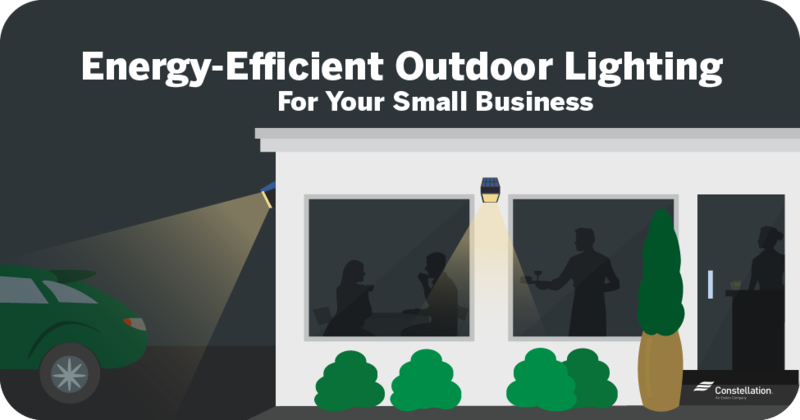 Traditional outdoor lighting, however, consumes a significant portion of a business’s energy use—nationally, outdoor lighting in the United States costs about $10 billion a year. Replacing traditional outdoor lights with modern lighted storefront signs and energy-efficient security lights can result in lower energy costs and increase your control over when and how outdoor lights operate. Why update to energy-efficient outdoor lighting? By updating their outdoor lighting, a business can lower both its energy usage and its environmental impact. Switching to commercial LED lighting or CFLs cuts outdoor lighting energy costs by approximately 50 percent, according to the Office of Energy Efficiency and Renewable Energy. What are high-intensity discharge (HID) lighting systems? Small business outdoor lighting often uses high intensity discharge lights, or HIDs. HIDS are the oldest type of electrical lighting, and work by sending electric charges through ionized gases within the light bulb. Often used to light large areas, HIDs are often present in areas such as garages and warehouses. As such, they are a popular choice for energy-efficient security lighting. And advantages of high intensity discharge lights include energy efficiency, plenty of light and long lifespans. When purchasing HIDs, look for newer models. Older models may contain mercury or even Polychlorinated Biphenyls (PCBs), making them potential safety hazards should a light bulb break. The amount of light cast by HIDs also diminishes over time, unlike LED lighting, which provides consistent lumen output. Enhanced energy efficiency. Energy-efficient outdoor lighting such as LED lights consume 75 percent less energy, potentially lowering a business’s energy bills. Reduced carbon emissions. Improved energy efficiency also means reduced carbon emissions, since less energy is required to run your business. LED lights also last 25 times longer than incandescent lights. Reduced light pollution. Energy-efficient outdoor lighting offers owners more control over their lighting options. Timers, dimmers, motion detectors and smart bulbs allow you to decide when lighting turns on and off. Increased public safety. Energy-efficient security lights make parking lots and the perimeter of your business safer for employees and customers at night. Improved appearance. Energy-efficient lights come in styles that can revitalize an aging storefront, improving a business’s appearance and drawing in potential customers. Use automated and smart technology. Advances in small business technology makes it possible to control lighting in ways that conserve energy and increase security. By using a smart hub, business owners can set up daily schedules so lighting turns on and off automatically at given times, dim lighting to change the mood, or monitor unexpected lighting use—all from a smartphone or tablet. Don’t light an area if it’s not needed. Unnecessary outdoor lighting wastes energy and adds to light pollution. If an area doesn’t need lighting, don’t light it (although definitely make an exception for security purposes). Turn off lights when not in use. Lighted storefront signs cost money to operate. If you’re not open, why light the storefront for any reason other than security? Few businesses are going to attract customers at two in the morning. Schedule lights to turn off when they’re not needed. Don’t use excessive amounts of illumination. Outdoor lights should complement your storefront and draw attention to your business. Excess lighting only adds to light pollution while blinding neighboring establishments and passersby. 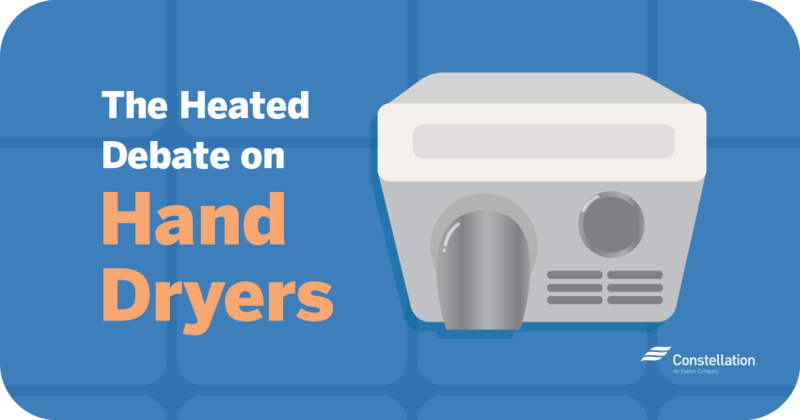 Use timers, dimmers and motion sensors whenever possible. Energy-efficient timers and dimmers help control lighting and energy use. Motion detectors ensure lighting is only on when it needs to be, turning on and off depending on whether the area is occupied. Look for “full cut-off” or “fully shielded” lighting fixtures. Light pollution (the brightening of the night sky by artificial lighting) is a major problem in many cities. Use lighting fixtures that don’t allow light to show above a 90-degree angle to reduce your contribution to light pollution. Fully shielded lighting can be retrofitted. Choose lighting sources with correlated color temperatures (CCT). To further combat light pollution, the International Dark-Sky Association recommends selecting lights with correlated color temperatures no higher than 3000K. Most products provide this information on the package. Protect your employees, customers and your business with outdoor security lighting. Often the need to conserve energy conflicts with the need for safety and security in the workplace. Energy-efficient security lighting satisfies both needs. By connecting spotlights to motion sensors, you’ll be able to light up the premises when needed. By linking motion detectors to security systems, you can receive alerts when outdoor lights go off at suspicious times. Show off the charm of your business using bedazzling string lights. In addition to lighted storefront signs, energy-efficient decorative lights can be used to improve the appearance of your business’s exterior. Such lights are well-suited to restaurants, cafés and salons. Make customers feel at-home with outdoor gas fire pits. Looking to add some romantic ambiance to your business? Outdoor gas fire pits provide lighting while keeping customers warm. Fire pits are great additions to patios and garden areas. Color-changing lights. Many smart bulbs and decorative outdoor lights change color, allowing you to change the atmosphere and ambiance of the business at a moment’s notice. Patio lights. 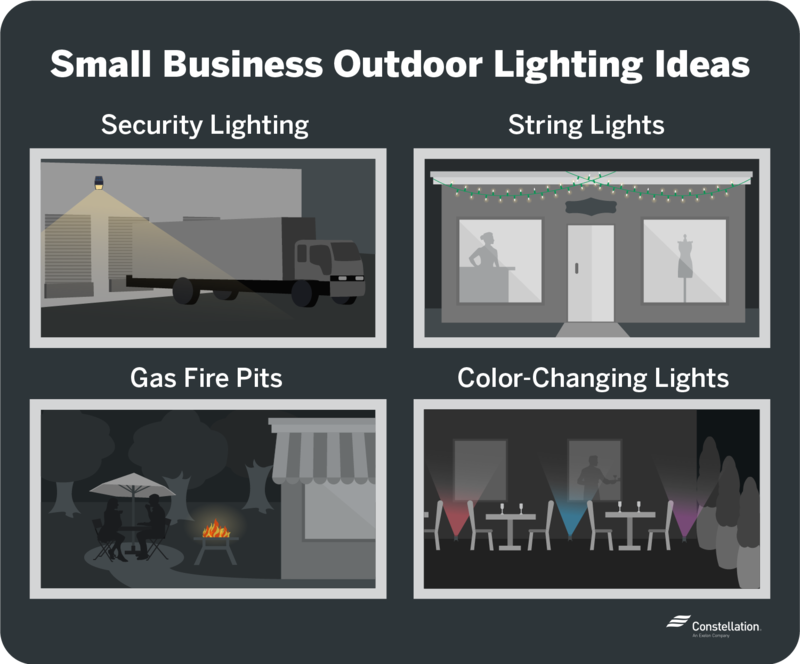 From hanging lights and LED rope lights to hidden sconces, small business owners have many options when lighting patios. Deck lights. Using lights to highlight landscaping and decks creates enticing and inviting outdoor effects. Spotlights. Spotlights can be directed to accentuate key aspects of a small business, such as outdoor presentations, stages, signage and outdoor sitting areas. Neon lighting was once the king of outdoor business lighting, but in recent years, traditional neon has largely been replaced with LED lighting. LED lights are brighter, longer-lasting and require less maintenance than neon. How much do lighted outdoor signs cost? An outdoor LED sign is a higher initial investment then traditional neon or incandescent lighting but pays for itself over the long term. LED bulbs have a lifespan of 25,000 hours or more, or 25 times the life of incandescent light bulbs. Easy to install and requiring little maintenance, outdoor solar LED lights are increasingly popular with small businesses for lighting pathways. Solar LED lights are also used in freestanding lampposts or as security lights. Solar LED lights convert sunlight into electricity through the day, storing power in batteries until nightfall. Many can provide light from dusk to dawn without increasing a business’s electricity bill. Location is an important consideration when choosing solar LED lights. Lights must receive significant sunlight, which can be influenced by geographic location, season and local surroundings. Check the “nightly run time” listing on outdoor solar lighting before making a purchase to see if the lighting system is appropriate for your setting. Nightly run times will vary depending on the season and how clear the sky is during the day. Be aware that operating times in the winter will vary between 30 to 50 percent if the lighting system is not correctly sized for winter operation. Which is better? Time-controlled versus solar outdoor lighting. Time-controlled and solar outdoor lighting perform the same function—providing much-needed light at night. 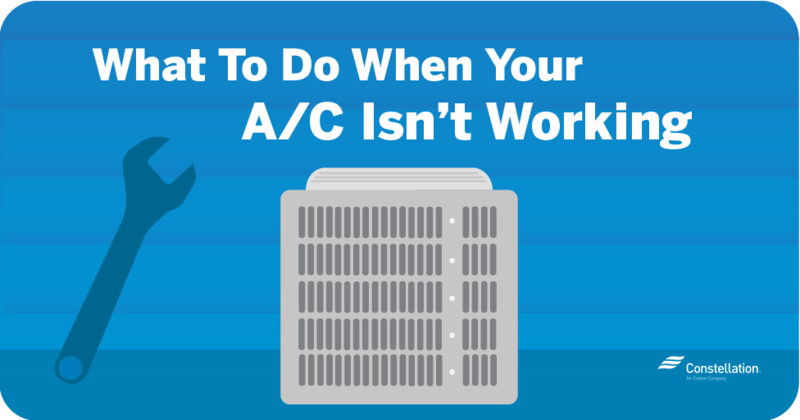 Depending on your business’s needs, one may be more appropriate than the other. Benefits of time-controlled outdoor lighting. Time-controlled lighting has the advantage that lights can be programmed to turn on and off at different times of day. 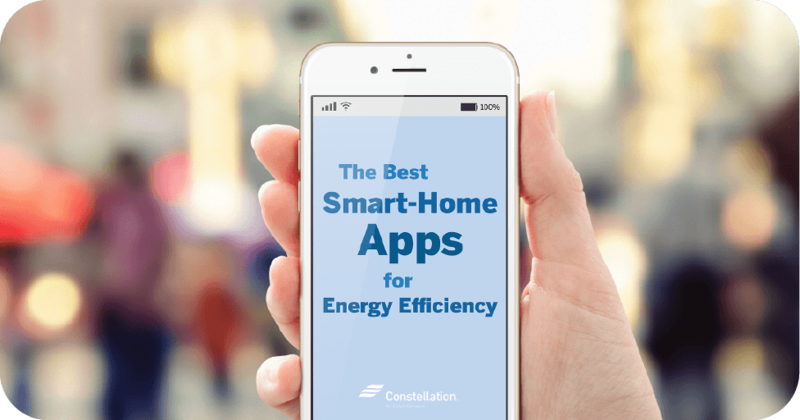 Time-controlled lighting often must be reset to reflect the change in daylight hours from season to season, although connecting smart bulbs to smart assistants and devices that provide sunrise and sunset times resolves this issue. Benefits of solar outdoor lighting. Solar lighting requires little input from small business owners—the lights come on when the sun comes down and go off when the light runs out of power. Some outdoor solar lights also have built-in timers that can be set to reflect a business’s needs. The main drawback to solar power is whether the photovoltaic cell receives enough sunlight to operate for the required length of time. During winter, for instance, solar lights many not be able to store enough power to remain on all night. 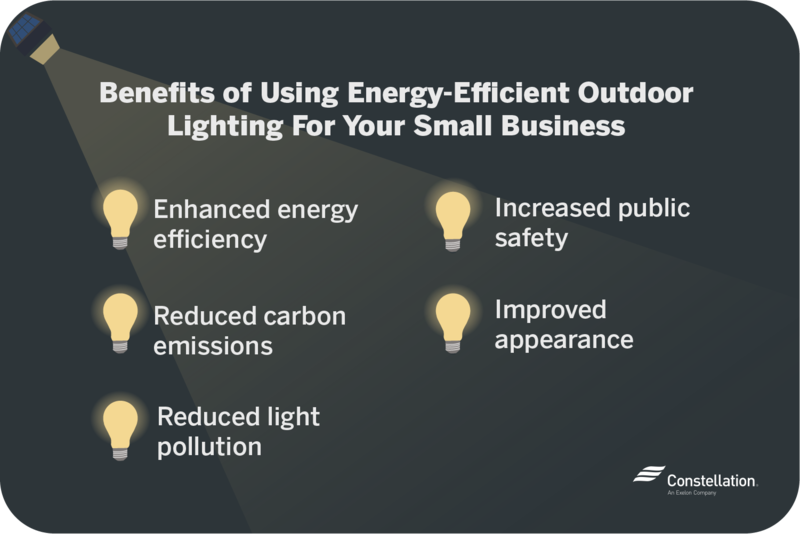 Energy-efficient outdoor lighting offers opportunities for businesses to improve their properties’ appearance, reduce energy costs and provide better security for customers and employees. If you’re still using traditional LED, neon or HID lights, it’s time to make the switch. Your business will thank you for it!